Using an iPhone, while your spouse is using an Android smartphone? Or you wish to share some of the pictures you shot with your iPhone to your Android devices? Below are the top 5 best ways to send pictures from iPhone to android devices. Got a new Android smartphone and want to transfer some photos from your iPhone to the new Android device? This short tutorial will do you a lot of good. It is about the best methods to send pictures from iphone to android without much effort from your end. We discussed about the best ways to – transfer images, videos and other media files from iPhone to Andriod phones and/or tablet devices. Note: I excluded the iTunes method because it’s normal with most iPhone users. Using the Google Photos app is the best method to get access to your photos/videos on any platform or device. It works with your Google account; once your Google account is logged on a device and Google photos app installed, you can get access to all your pictures on that particular device. Download the app (Google Photos) on both devices. Click on the link to download for iOS or Android. Sign in with your Google account, activate the synchronize and backup feature. Set the app as your default photo application. The photos will automatically appear on both devices. The use of Google Photos app works perfectly when you’re the owner of both devices. Sending a picture to a friend through this app is quite stressful and not advisable. Messenger Apps are also a good medium to transfer pictures from your iPhone device to an Android phone or tablet device. The only need for this method is – an internet data access. You’d need to have to have an active internet data access to share pictures through this medium. Steps to send pictures from iOS to Android via Messenger Apps. Both devices must have the Messenger App installed on them. In some cases, the sender is required to have the mobile number of the receiver or friends with the receiver (depending on the Messenger used). Attach the pictures as a message(s) and send to the receiver; the receiver downloads the image and its stored on his/her device. If you don’t have a decent internet data bundle, the two methods above would be a big deal for you. You should probably consider using some third-party sharing Apps like Shareit, Xender, and FotoSwipe. They’ll come in handy for transferring files from one device to another through the use of Wi-Fi Direct technology. No internet access is required for this method. Only these tips are necessary for this method. Both devices must have the sender app installed on them. Connect both devices to the same wireless network. The sender creates a connection and the receiver is expected to join the connection. Select the pictures to send and hit OK or SEND button. The pictures start transferring immediately. Just like the name, this is a Wireless, secure and instant photo transfer wizard. Wireless Transfer App lets you transfer images/videos from your camera roll or photo library to an Android device. It is a very useful app for migrating all the media files on your old iPhone to a new Android smartphone or device. 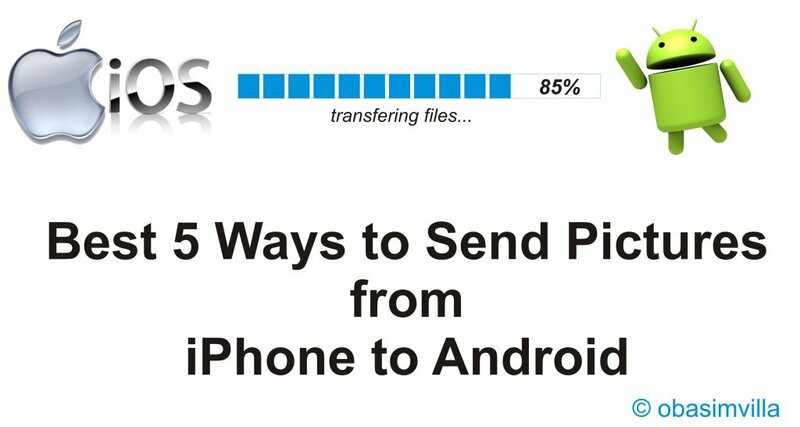 Steps to use Wireless Transfer App to send photos to an Android device. Requirements: iOS 4.3 and above, Android 4.1 and above. Download the latest version of the app from this link. Install it on both devices. Launch the app, making sure that the two devices are connected to the same wi-fi network. Select pictures to be sent from the iPhone. (on the Android device) click the receive button and the pictures will start downloading immediately. CopyTrans serves as a good option for sending pictures from iphone to android devices. First, you’d have to copy the photos from the iPhone to a PC and from there, move them to your Android device. Install the app on your machine. Launch CopyTrans Photo and connect the iPhone using a USB cable. The contents/folders on the iPhone will appear on the left side of the main program window. 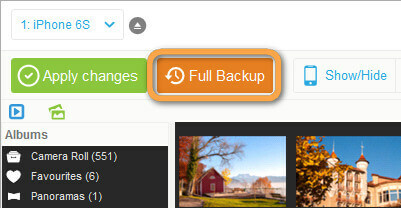 Tap the orange button with “Full backup” on top. Create a new folder or select an existing folder to copy the pictures on the iPhone and click OK.
Open the device storage under “My Computer”. Drag the folder containing the iPhone photos and drop inside the DCIM folder on your Android device. The photos are successfully saved to the Android device. This is all we have to share today on how to send pictures from iPhone to android devices. It is a straightforward tutorial and as such – can be used by everyone. Ever tried out any of these methods or have some more to suggest? We would love to discuss them in the comments section below. Remember to show some love by sharing this page with friends and followers alike.